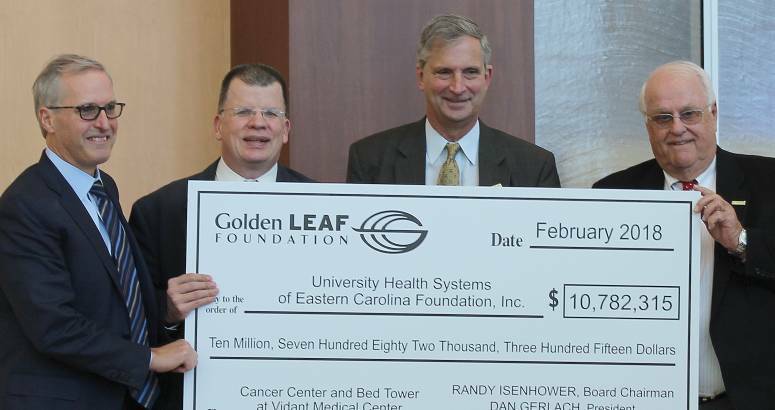 The Golden LEAF Foundation recently awarded almost $11 million to Vidant Health Foundation to fund major equipment as part of a new state-of-the-art Vidant Cancer Care at the Eddie and Jo Allison Smith Tower in Greenville. 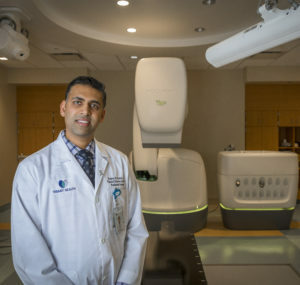 Rajen Patel is a physicist with Vidant Radiation Oncology who has been calibrating the radiation equipment, including the CyberKnife pictured above. The facility will provide specialized healthcare to residents in Greenville, and throughout the network of Vidant Health centers in Eastern North Carolina, where a cancer diagnosis means a higher mortality rate compared to the national average. More than 7,500 new cases are diagnosed each year in the region. The Center will also create nearly 200 healthcare jobs and train 3,500 new professionals – filling a critical need for specialized health care in a rural part of the state. Healthcare continues to be an economic driver and trained professionals are particularly important to underserved regions such as rural Eastern North Carolina. Vidant Health invested more than $170 million in construction and equipment upgrades for the center. About $40 million of that cost is being funded through philanthropy. The Golden LEAF grant helped support clinical equipment as well as conferencing technologies for care planning and education, connecting all of Vidant’s regional hospitals. 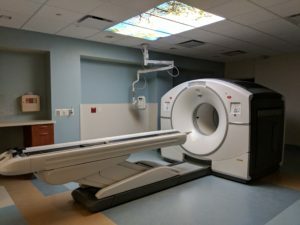 Vidant Cancer Center opened to patients March 2018 and features some of the most advanced cancer treatment equipment available. Among the features of the 418,000-square-foot facility are three distinct clinics and 58 clinical exam rooms; one multidisciplinary clinic and 12 exam spaces; stereotactic radiosurgery technology and five radiation therapy vaults; advanced radiology services, including a PET/CT scanner and 3D mammography, ultrasound, and bone density screenings; and pharmacy and laboratory services. Golden LEAF President Dan Gerlach said the project resulted in multiple wins for Eastern North Carolina: improved rural healthcare access as well as much needed jobs and a boost to the regional economy. The Golden LEAF grant will help enhance the effectiveness and efficiency of care delivery, improving the patient experience. Increasing access to quality healthcare close to home gives families and patients the ability to remain in their community — without compromising top-quality care — while improving mortality rates. The partnership between Golden LEAF and Vidant Cancer Care at the Eddie and Jo Allison Smith Tower in Greenville aims to bring a greater quality of life to Eastern North Carolina for current and future generations.